Blowout Sale! Save 51% on the Shepherd Hook 48 inch 2 Pack 2/5 inch Thick Heavy Duty Rust Resistant Garden Outdoor Hanging Plants Basket Hanger Pathway Light Solar Lantern Mason Jar Wind Chimes Wedding Black by BEAU JARDIN at Halo Grow Box. MPN: SH48x2. Hurry! Limited time offer. Offer valid only while supplies last. Beau Jardin offer 35inch,48inch,65inch long shepherd hook,This set includes 2 pack 48 Inches tall,0.4 inch thick heavy duty shepherd hooks. Beau Jardin offer 35inch,48inch,65inch long shepherd hook,This set includes 2 pack 48 Inches tall,0.4 inch thick heavy duty shepherd hooks. QUALITY:Made with Durable Premium Heavy Duty Solid Steel 0.4 Inch Diameter Thick Steel Wires Provide More Strength for Heavy Flower Pots or Baskets.Strong enough to hang any normal plants. RUSTPROOF:The powder coating not only makes it free from rain,rust resistant in damp weather,Providing Stylish Shiny Black Looking Which Adds Special Scenic Views to Your Lawn and Garden. 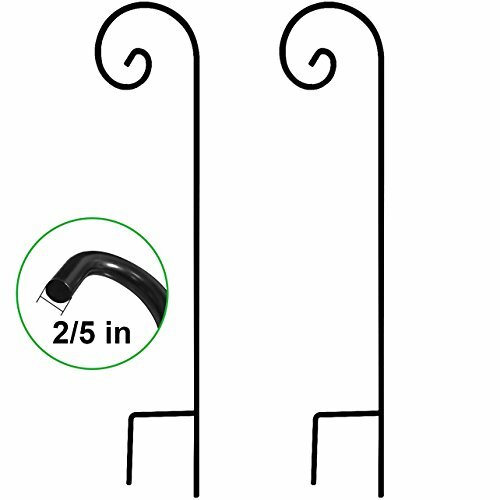 WIND RESISTANT:This shepherd hook is inwards curl crook hook instead of the common outwards,makes the hanging enough better in the tropical storm season and heavy wind days. MULTIPURPOSE:Endless Uses for This Set.You can Beautify Your Yard by Hanging Flower Planters,Bird Feeders,Holiday Decorations,Mason Jars,String Lights and Lanterns. Or Use Them to Hang Insects Repellent,Garage Sale Signs,Wedding Decorations.So Many Usages You Can Imagine! EASY TO INSTALL:Each shepherd hook come in one solid piece ready to go in the ground,no assemble needed.Easy to be Carried Around for Special Events Like Wedding Ceremonies,Garage Sales and Other Special Events. GUARANTEE:If you'd like your money back,no worries.Anytime.Just ask. Click the "Add to Cart" button on top to accessorize your outdoor living space now! DURABLE AND HIGH : The double black heavy duty garden shepherds hook with a 48 inch tall and a 2/5 inch diameter one piece wrought iron metal garden hanging hooks, much thicker than other brand 1/5 inch garden shepherds hooks, makes you have the confidence you have the strongest and most thick garden shepherd hook for hanging bird feeder pole or garden plant stakes, just bring your heaviest flower pot basket or bird feeders pole. ANTI-RUST : This shepherds hook 48 inch will came ready to use and there no plastics or complex assembly involved.These double shepherds hook can be used year after year as the glossy finish prevents from rust and the black color remains lovely. Stake the tall shepherds hook directly into the ground for a humming bird feeder pole stand hanging solar lantern, and begin enjoying a beautiful garden immediately. MULTI-PURPOSE : Beautify your outdoor living space by garden hanging planters, flower pots,bird feeder poles,lanterns,candle holders,garden lights,mason jars,holiday decorations,string lights,wind chimes,ornaments,flower balls, bird baths,insect repellents,shooting targets,acre bug zapper hanger,mosquito lights,isle markers,buckets of sand for ashtrays and more!Enhance garden look and place these shepherd hooks around pathways,flower beds in around bushes in your garden or yard for decoration. STYLISH AND BEAUTIFUL : The heavy duty shepherds hook great for outdoor wedding aisle hook crook stake hanging flower balls and mason jars,tall shepherds hook for bird feeders and poles,outdoor plant hangers and Christmas decor hangings,hang your flying ghost and halloween solar lantern.shepard hooks for wedding and yard hooks for lanterns and garden stake.Powder coated not only resistant rust but also providing stylish shiny black looking which adds special scenic views to your lawn and garden. GUARANTEE : Any bent during normal usage, or any dissatisfaction with the shepherds hook, contact us, replacement or refund both accepted. Our goal is to make you completely satisfied with this purchase. We will always give you a reasonable solution.